Melt butter over medium heat. Add onion and garlic and cook, stirring, until tender, about 3 min. Stir in broth, tomatoes, kidney beans, cauliflower, carrots, zucchini, beans and Italian seasoning. Cover and bring to a boil. Reduce heat; simmer covered 10 min. Add pasta. Cover and simmer 10 min longer or until pasta is tender. In large measuring cup, whisk flour into milk. Gradually whisk into soup. Cook and stir over medium heat until mixture boils. Stir in kale and pepper; gently boil 2 min. Taste and add salt if needed. Serve sprinkled with Parmesan. 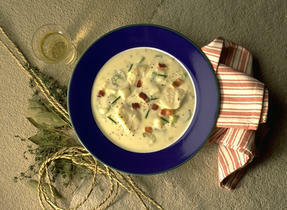 If soup is too thick the next day, thin with broth or water. Watching your sodium? 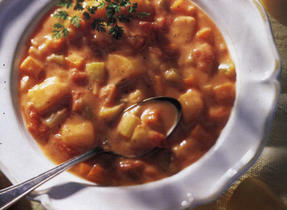 Look for low-salt or no-salt-added chicken broth and canned tomatoes and eliminate salt in recipe. Of course regular broth and tomatoes work as well. 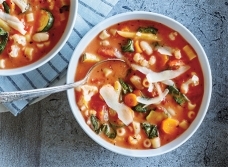 This soup makes a perfect pre-activity meal – fast for the cook to make, and nutritious for the kids. Minestrone is the perfect soup to use leftover little bits of vegetables like peas and broccoli. 103 people love this recipe.